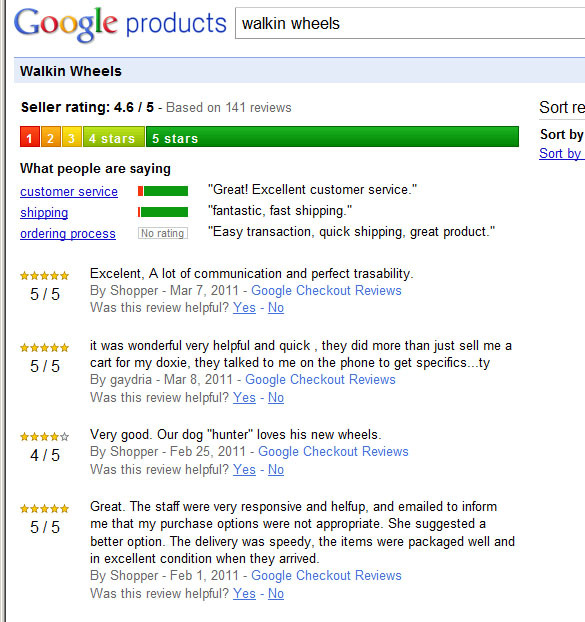 Dog Wheelchairs reviewed on Google Checkout. Walkin’ Wheels received 4.6 of 5 stars. 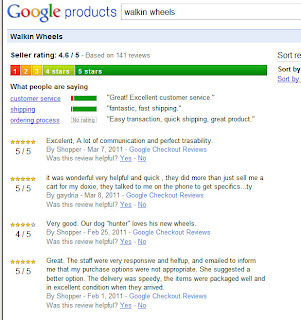 When looking for the best dog wheelchair, read the reviews! Now, I’m not talking about the reviews and testimonials that you read on the manufacturer’s websites. These can be informative but are usually not impartial. In fact, some manufacturers will use ridiculous, highly slanted and sometimes deceitful comparisons. The impartial reviews can be found of the Google Checkout system. When choosing the right dog wheelchair, use the impartial, professional review system and avoid the manufacturers who try to disparage others. Walkin’ Wheels receives reviews like this because the innovative design really is easy to buy, simple to use, and really WORKS. Author Mark C. RobinsonPosted on April 3, 2011 Categories UncategorizedLeave a comment on Dog Wheelchairs reviewed on Google Checkout. Walkin’ Wheels received 4.6 of 5 stars.